We are quite sure that many of you reading this article have no idea what Arepas de Pernil means, let alone what type of food it is. To put it simply pernil is spanish style roasted pork. Many spanish countries have thier own rubs, sauces and styles of cooking the pernil but it is almost always slow roasted in an oven with herbs and spices. This cooking method helps to create super tender, fall off the bone pork that is very similar to pulled pork. Arepas are small corn patties made from ground corn meal that has been pre-cooked. The cornmeal is mixed together with water to form a dough, which is then formed into patties. These patties are then grilled, fried or baked depending on what country you are in. Once the patties have been cooked they are split open and stuffed with any number of combinations of meats, vegetables and cheeses. They are very popular in Central and South America. It was only a few years back when we first heard of an arepa. There was a place in the Lower East Side of Manhattan called Caracas Arepas that was selling authentic arepas. They were getting quite popular and even scored a spot on Throwdown with Bobby Flay. Flay tried his best to recreate the arepa but had no luck. He lost because got a bit too fancy and lost the authenticity of a traditional arepa. Nevertheless the arepas looked amazing so we had to try them. Interestingly enough they were building a second Caracas Arepas a few blocks from our apartment in Williamsburg, Brooklyn. A week or two later the new location was open and we made our way there. The arepas were amazing. They were these hand held sized corn pockets filled with pernil, a mango sauce and cheese. Topped with their own homemade "secret sauce" we had fallen in love. Since that day we had visited Caracas Arepas numerous times, after each visit we talk about making them at home but never have. We finally found a worthy recipe (actually from the owners of Caracas) and tried our hand at making Arepas. In a blender, combine the Worcestershire, guava paste, peppercorns, ginger, fennel seeds, cumin seeds, bay leaves, oregano, and garlic. 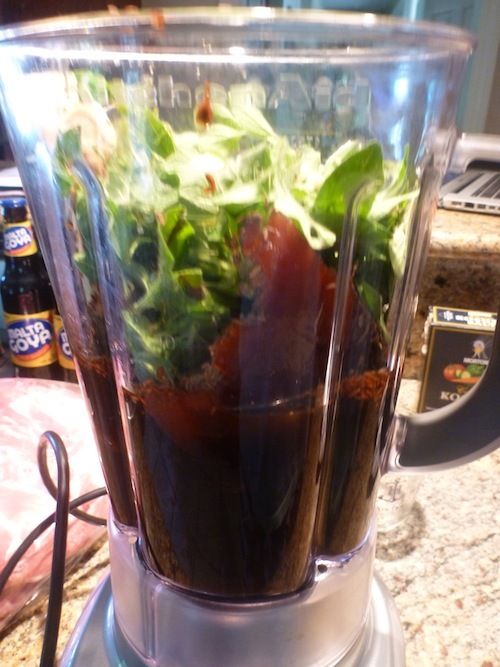 Transfer the marinade to a Dutch ovenor other large pot; stir in the malt beverage. 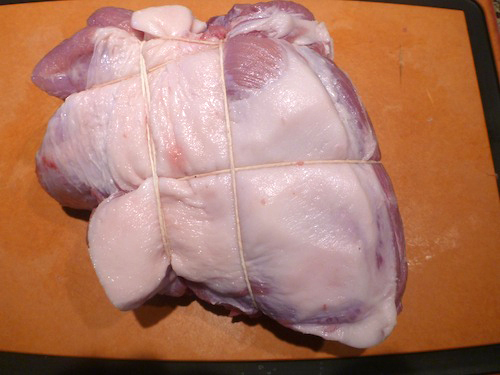 Add the pork; cover and refrigerate 24 hours. Bake until the meat shreds easily with a fork, about 4 hours. add the garlic and jalapeno. Fry until lightly golden, about 2 minutes. With a slotted spoon, remove the garlic and jalapeno; transfer to a blender. Add the mango puree, olive oil, cilantro and papelon; blend until smooth. Refrigerate in an airtight container until ready to use. Slowly pour the cornmeal into the water. Knead together the cornmeal and water until blended and smooth. With wet hands, divide the dough into 6 even portions. Roll each dough portion into a ball; pat it into a 3 to 4-inch disk, about 1/2-inch thick. 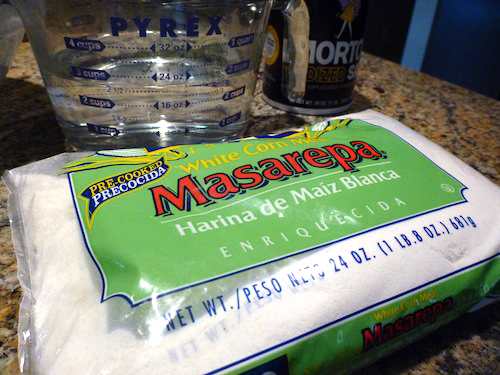 Heat oil in a cast-iron skillet or on a griddle over medium heat; add the arepas. 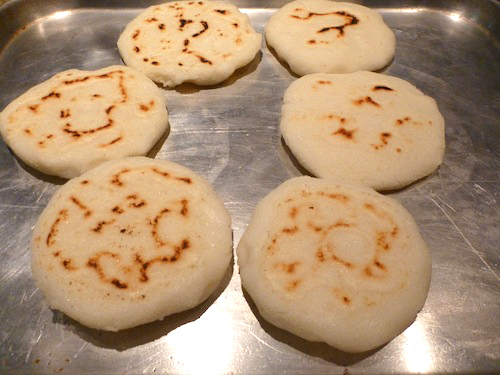 Cook the arepas until golden brown on both sides, turning once, about 10 minutes. Transfer the browned arepas to a baking sheet and bake until cooked through, 10 to 12 minutes. To serve, partially split the hot arepas (not all the way around); remove some dough to make room for your filling. Fill the arepas with warmed pulled pork, tomato slice, and a dollop of mango sauce. Serve immediately. This recipe was almost perfect, the arepas were so close to tasting exactly as they do in the restaurant. The corn patties were super easy to make. A small amount of water mixed with the corn meal created this smooth corn dough that browned on the griddle. After they are cooked through the patties are good to eat even on their own. In some countries they are eaten split open and slathered with butter for breakfast. The patties also provide a perfect vehicle for delivery of all of the meat, vegetables and sauces to right to your taste buds.. They have a slightly salty corn flavor and absorb any excess sauce and juices. The pernil was fall off the bone delicious. The marinade did not impart as much flavor as we thought it would but it did add some flavor. You could easily make this recipe without the marinade and it would taste just as good. The mango sauce really gave this dish it's signature flavor. The sauce had the right combination of sweet and heat while still providing huge flavor that melded seamlessly with the salty pork. The mango is what hits you first, with its sweetness. Meanwhile the heat sneaks up on you, thanks to the garlic cloves and jalapeno peppers. The heat is not overpowering but is noticeable and creates a nice depth of flavor to the sauce. This sauce would work nice with other dishes as well as this one. We would easily marinate chicken in it, or use it as a dipping sauce. Also on our arepa we put some of Caracas "secret sauce" that is similar to the mango sauce but adds another dimension of flavor (click here to find out what it was). We think this recipe is a Should Eat for everyone. Those who have had arepas before will love the authenticity and flavor of a traditional arepa right in your own home. For anyone who has never heard of an arepa before it provides a great easy to follow recipe that will open your taste buds to new dishes from around the world.